This was a looping 80 mile ride from Chelsea, via various parts of Surrey and ending up in Richmond. The theme was roses, in pub names, street signs or the chocolates which were freely dispensed by ride leader Conor ‘Mackadoo’ McAnally - did you spot several Rose & Crowns, the Rose, Olive Branch, a Rose & Thistle or Rose Lane? It didn’t quite snow, and it didn’t quite drop below freezing, but it was perishingly cold. Due to a mix-up within a mile of the finish, we even left a couple of markers uncollected, for which my grovelling apology is offered. This was a shame as the drop-off system had worked flawlessly for 79 miles. The attendees were most intrepid, with only one leaving early with the excuse of ‘having to do some work this afternoon’. From my privileged position as last man, it was a pleasure to see the high standard of machine control, especially in the formation U turn through the pub car park which everyone seemed to achieve feet up on full lock at 5mph. It certainly entertained the staff, who came running out to watch. 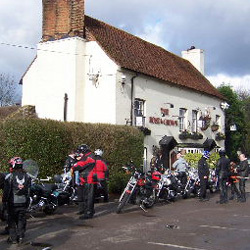 On arrival at the Rose of York, all participants were presented with a single red rose for Valentine’s Day, and after a drink and a spot of lunch it was off home to thaw out. Next ride is 13th March, but don’t miss the pre-season planning meeting on 3rd March at The Tup.